If you’re wondering about forklift jobs for 2019 and into the 2020s, you’re not alone. From automation to robots to OSHA rules and regulations, there are plenty of considerations for forklift drivers, pallet jack operators, and other powered industrial truck employees heading into the New Year. ForkliftCertification.com offers critical skills, safety knowledge, and other important intangibles to help any forklift driver become a standout employee and an impressive job candidate. That’s true for 2018, 2019, or any year. We’re often asked about next year’s job market for forklift drivers. Keep reading for our take on some of the most important factors to keep in mind as we say goodbye to 2018. Forklift Operator Job Market: Steady Growth, Drivers Wanted! Robots taking over all the jobs. Automation making forklift drivers obsolete. Fully computerized warehouses and terminals. If you’re a forklift driver, you’ve probably heard all sorts of (bad) information about the future of forklift jobs. Well, there’s no need to hit the panic button. According to the U.S. Bureau of Labor Statistics (BLS), the job market for forklift drivers will continue to grow into 2019 and the next decade. A recent job market study indicated 3-4% job growth for forklift drivers through 2024, which is about on pace with other manufacturing related employees. Consider this: there are over a half-million powered industrial truck operators in the United States. In 2014, nearly 540,000 people made a living as forklift drivers, pallet jack operators, and similar industrial truck jobs. And they’re not going away anytime soon. Here’s one way to gauge the current forklift job market: do a nationwide search on one of the largest job sites. At Indeed.com, for example, there are usually well over 100,000 forklift jobs posted at any given time. 2019 and the 2020s are shaping up to be a great time to be a well-qualified forklift or pallet jack operator! Warehouses and distribution centers are becoming more high-tech and automation friendly, but that doesn’t mean OSHA regulations are going away. In fact, updated rules and guidelines are always in the works. OSHA doesn’t always follow through with legislation, but it’s always a good idea to keep an eye on their Powered Industrial Truck e-Resource page just in case. Of course, if you’re signed up with ForkliftCertification.com, you’ll always have the most up to date OSHA guidelines in place. Staying current with OSHA regulations shouldn’t be difficult, and it’s not with our training courses. We’ll make sure any recent updates to OSHA rules are reflected in our training courses. Safe Forklift Drivers are Always Wanted! 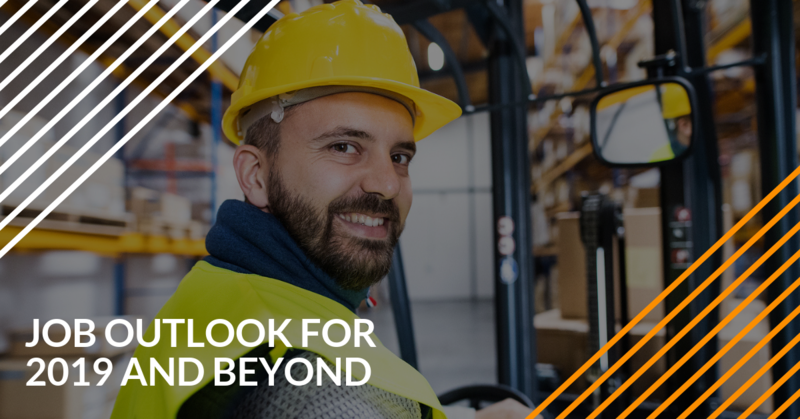 Here’s one thing you can’t deny about the current and future job market for forklift operators: the best-trained employees always have the best opportunities for great jobs. From well-paying careers to jobs with outstanding healthcare benefits, it always helps to have the most up to date OSHA-approved training. Training Kit – if you want to show employers you’re serious about your craft, sign up for the Training Kit today. Train a Trainer – here’s a great plan for getting that dream forklift job: become a Certified Forklift Safety Expert. With the Train a Trainer course, anything’s possible for your future! Bundle Package – for a special discounted rate, you can have the Training Kit and Train a Trainer packages…talk about a well-rounded career plan! Don’t delay with your training – other job candidates certainly aren’t! Give yourself the best possible chance for a rewarding forklift career. Sign up today! For any questions about our OSHA approved forklift training packages, call us today at (888) 278-8896.